Joseph Bexton Adcock was born in Quorn in 1827, and died on 27th December 1867 from injuries caused by an accident at work on the previous day. Joseph was 40 years old. Joseph’s death required an inquest, which was held by the coroner John Gregory on 30th December 1867 and reported in the local press. FATAL ACCIDENT – On Monday last an inquest was held at Quorndon, before J Gregory, Esq., coroner, on the body of Joseph Adcock. Deceased was employed as a shunter in the employ of the Mountsorrel Granite Company, and on Thursday 26th ult was assisting in drawing some loaded trucks from the quarry to the siding of the Midland Railway, and when they got to Sileby Lane bridge deceased was going to unhook one of the wagons, when he was caught by the wagons and was crushed between the hooks. He was conveyed home and attended by Mr Harris, surgeon, but he died the following afternoon. The jury returned a verdict of ‘Accidental death’, and recommended that there should be a sufficient distance between the hooks to prevent a man being crushed between them. On Tuesday last, an inquest was held at Quorndon, before J. Gregory, Esq., coroner, on the body of Joseph Adcock. Samuel Hubbard said he was servant to Mr Lindsey Hall, of Barrow. Deceased was employed as a shunter by the Mountsorrel Granite Company, and was 40 years old. The deceased met with an accident on Thursday, the 20th December [should be 26th December], between two and three o’clock in the afternoon, near to the junction of the Mountsorrel branch with the Midland line, and in the parish of Barrow. The Mountsorrel Company had a locomotive steam engine to bring their trucks from the works down to the junction, but when it was out of repair horses were used for the purpose. The engine was not at work on Thursday last, and Mr Hall’s horses were employed instead. Between 11 and 12 he started from the Mountsorrel end with four trucks of stone and an empty waggon, drawn by four horses to take them to the junction. On arriving at the siding, deceased should have unhooked the waggons, but failed to do so, and when the waggons came together, deceased came from under, and said he was hurt. He was at once taken to Mr Hall’s where some brandy was procured, but he died the following day. From the medical evidence it transpired that the deceased had got between the fixed hooks, and was struck between the naval and right hip. The deceased’s death was caused by the rupture of some of the inward vessels. – The jury returned a verdict of “Accidental Death”, and recommended that there should be a sufficient distance between the hooks to prevent a man being crushed between them. 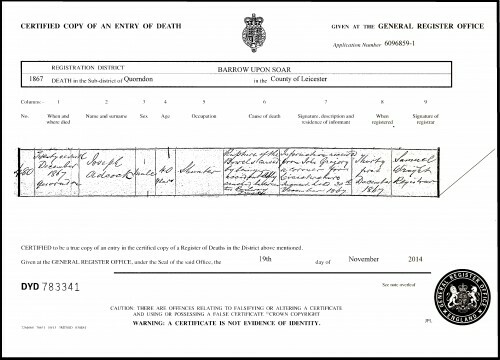 According to the death certificate, the date of the inquest is given as 30th December 1867, a Monday. If this is correct, the date of the inquest given in the Leicester Chronicle would be incorrect. There is a further report of the inquest in the Leicester Mail, dated 4 January 1868. This is very similar to the report in the Leicester Chronicle. Thank you to Joseph's great great grandson, Martin Adcock, for providing this information.